WeTheme worked with the Madeira Theme Park to create two small technical demonstrations: one short animation, the second an interactive experience. Included in the final deliverable were documentation on tools, pipeline for future students to use when developing new content for the theme park, most efficient tools, design documents, instructions on testing and implementation as well as required roles, and methods for development. The Parque Temático da Madeira (Madeira Theme Park) located in Santana, about a one hour drive from Funchal. The park covers seven acres of land with a multitude of attractions relating to the history, traditions and culture of Madeira. The attraction we will work on is a CAVE, a virtual environment utilizing four projections to display images on a room-sized cube. The room is about 64 m 2 (700 ft 2) with a bridge running directly through the center, leading guests into and out of the pavilion. Our goal for the semester was to create two small technical demonstrations: one short animation, O Faroleiro e a Espada (The Scabbard Fish and the Lighthouse keeper), and the second an interactive experience, Ilha Musical (Musical Island). For this project I was documentation lead, writing weekly newsletters for faculty and staff, creating power point presentation materials and documenting the 14 week project such as most efficient tools and pipeline, as wells as archiving art, code and sound assets. 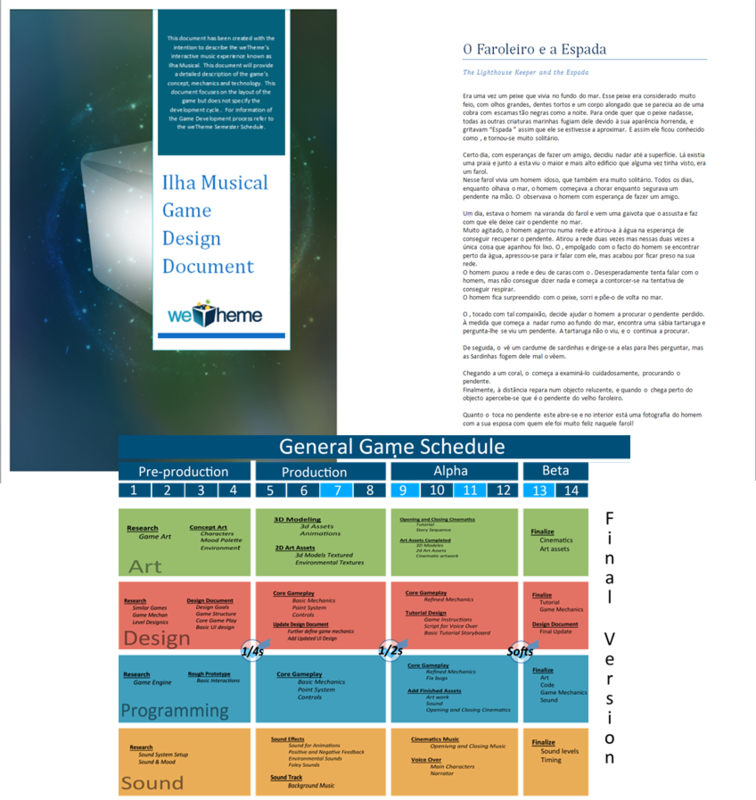 I wrote and edited the script for O Faroleiro e a Espada and I did intensive research on rhythm/musical games and created game mechanics for Ilha Musical. Inspired by traditional Madeiran music and instruments,Ilha Musical is an interactive experience in which guests must help growingflowers and creating buildings to create a village of joy and beauty to theIsland of Madeira by playing instruments and singing through kiosk andmicrophone. O Faroleiro e a Espada, The Lighthouse Keeper and the Scabbard Fish, is a short animation with the goal of telling a story in a four screen room. The story follows the journey of the Espadeta, an ugly black scabbard fish; trying to find a friend. As he swims to the surface,he encounters a lonely lighthouse keeper, who spends his days gazing at a locket with an image of him and his wife. When he accidently drops the locket into the sea, the scabbard does everything he can to retrieve it, and by doing so saves the man and both gain a friend. Lastly, we provided documentation of both experiences including most efficient tools,design documents, instructions on testing and implementation as well as required roles and methods for development. This information can be found in our Project Archive.